If affordability and efficiency are what you seek in a house clearance company, get in touch with us today. Away With It are a fully licensed firm serving the Bow area and we pride ourselves on our customer care and flexibility to all requirements. We can even provide same-day quotes and collection if it suits you! Whether you have one item or an entire property’s worth of bits and pieces you want to dispose of, the Away With It team can help. No job is too big or too small. 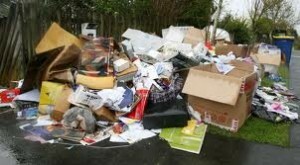 We know that some refuse centres do not accept certain items and people are left unsure of what to do. The answer is to get in contact with us and we will remove any non-hazardous item from your home that you want gone. If you are worried about budget, you will always pay the best possible price with Away With It. Unlike other house clearance firms, we charge by volume of waste removed, not by “load”. This often guarantees that our house clearance services are far more cost-effective. As a customer, Away With It believe that our services should be 100% tailored to your needs. Instead of us telling you when we are free, you tell us the date and time you require us. We want you to have the easiest experience possible so we will always fit in seamlessly with your plans. For this reason we offer quotes and collections seven days a week, from early in the morning to late into the evening. As a result, no matter what your plans, we can fit our service to your specific needs. Furthermore, with Away With It, you won’t need to stay at home all day patiently clock watching. Instead, we will liaise with you in advance, detailing specific arrival times and any other pre-clearance requirements. So, whether you’re in the midst of a house move or cannot get any time off work, we can clear your house whenever it is best for you. We have been operating in Bow for over 15 years and, over that period, we have seen customers coming back and recommending us to friends and family time and time again. Our teams always deliver the best possible service and this ensures our customers are happy and satisfied. With a hard-working and friendly team to clear your house, who tidy your property after the job is complete, you will be hard pushed to find a higher level of service. Call our friendly team today to find out more about house clearance in Bow. We will be able to take you through the process, give advice and answer any questions you may have. If you want to discuss your needs for house clearance in Bow or would like to receive a quote from our team, give us a ring on 0208 504 7390 or 07957 123019. We are happy and available to take your call 7 days a week, from 7am to 11.30pm.